Justin Sullivan/Getty ImagesMcDonald’s is offering a new perk for workers. McDonald’s is debuting new career and academic advising tools for workers, the fast-food giant announced on Tuesday. The move follows McDonald’s announcement earlier this year that it plans to triple employee tuition assistance. Fast-food chains are looking for creative solutions to win over workers as competition for labour heats up. McDonald’s is adding a new perk for employees as fast-food chains battle to win over workers. On Tuesday, the fast-food giant announced that it is launching a new campaign called “Where You Want To Be,” which partners a handful of workers with experts, including rapper Yazz the Greatest and dermatologist Meena Singh, to discuss career options. The goal of the campaign is to highlight new career advising tools available to the company. Starting Tuesday, the company is providing all restaurant employees with free career and academic advising services. In 2019, McDonald’s will also launch a mobile app intended to provide academic and career guidance within and outside of the fast-food industry. The move follows McDonald’s announcement earlier this year that it plans to triple employee tuition assistance as well as reduce the amount of time needed to work at McDonald’s to receive funding. “Everybody wants to feel recognised, everybody wants to feel valued, everybody wants flexibility,” Melissa Kersey, McDonald’s US’ chief people officer, told Business Insider. Kersey said that McDonald’s hopes that the new initatives help reduce turnover and assist with hiring. 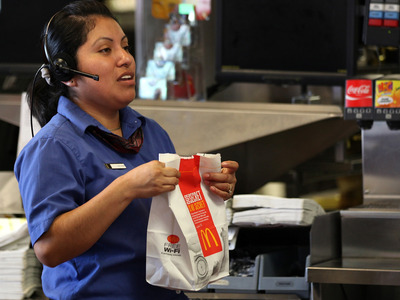 The competition for fast-food workers is increasingly tight. There were 898,000 open jobs in the accommodation and food-services industry in August, according to a monthly report released by the Bureau of Labour Statistics. For comparison, that’s 146,000 more positions than were open in August 2017. Panera is addressing the “war for talent” by revamping its recruitment and training systems. Other chains,such as Jack in the Box and Dunkin’, are investing in automation to cut down on the number of necessary workers.Retailers like Target, JCPenney, and Kohl’s are raising wages and adding benefits to deal with similar issues.